Home|CUBAN CIGARS NOW LEGAL – SMOKE EM’ IF YOU GOT EM! CUBAN CIGARS NOW LEGAL – SMOKE EM’ IF YOU GOT EM! SMOKE EM’ IF YOU GOT EM! Cuban cigars have long been considered the best in the world. Unfortunately, it has also been illegal for an American citizen to smoke Cubans anywhere in the world, until now. Obama’s Administration has been less than stellar to say the least (but lets keep politics out of it). One thing we can all get behind is the administration’s recent decision to re-open relations with Cuba. Effective today, Americans can once again enjoy some of the finest tobacco on the planet. Why is our newfound ability to buy Cuban cigars so celebratory? Cuban cigars are the best in the world – so much so that the two words have become almost synonymous. But how did Cuban cigars come to set the standard for all others? Lets take a trip back in time…. When Christopher Columbus arrived in the New World and the island of Cuba in 1492, he came across natives smoking tobacco wrapped in plantain and palm leaves, a prototype for the first cigars. This was common practice in the Americas, but new to Chris and the boys. Spain began to manufacture cigars and improved on the process by drying and fermenting tobacco leaves to maximize the flavor of the cigar, and an entire industry was born. Over the centuries, Cuba began to dominate the cigar scene. Operations moved closer to tobacco farms leading to increased cigar quality (since the leaves didn’t have to travel overseas to be prepared and wrapped). Cubans experimented with different types of leaves for each of the three parts of the cigar (the wrapper, the binder and the filling) until they got it right. Then along came this guy. His Commie ways earned him a special place on the United States sh*t list. Cuba was slapped with enough embargoes to destroy its economy and quality of life. 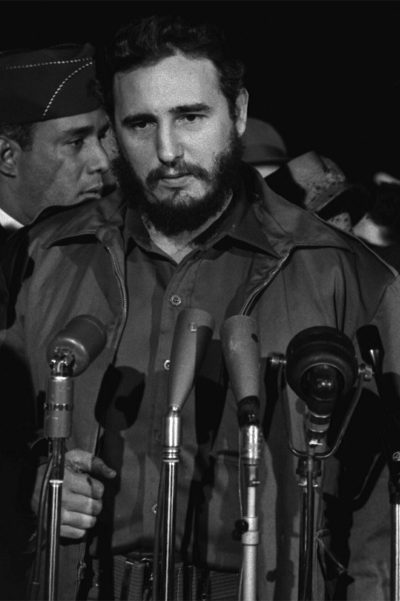 But one thing that Fidel Castro appreciated, respected, and enjoyed was his cigars. He ensured the industry remained unharmed and it endures today as it did when he came to power. As cigar making is an art, not a science, Cuba has been able to maintain its standing in the cigar world, even without the technological development of the competitors. Under the new terms of agreement, citizens of the United States may indeed travel to Cuba and purchase previously contraband cigars. Unfortunately, purchases are limited to $100 and cannot be resold in the United States. Welsch said there is a whole lot of interest and “mystique” surrounding Cuban cigars. He said that many people assume they sell Cuban cigars off the books, but that’s not the case. They don’t sell any at all. He said some people think Cuban cigars are the best, but Dominican cigar making and tobacco farming have made huge strides since the Cuban embargo started. Resale or not, I have a bottle of EC23 I’ve been waiting to crack open. Now I have a suitable mate to pair my pour up with!